Born in Valencia, Venezuela on July 31, 1950, into a family of department-store owners. He moved to Milan, Italy in 1973 to study printmaking and photography at the Scuola Cova, and later he studied design with Bruno Munari at the Instituto Politécnico. Largely self-taught as a painter, he was by 1974 creating installations and performance pieces. In 1980 he return to Valencia and began making regular trips to New York, where he lived from 1982 to 1984, and again in 1992 to 1994. Returning to Venezuela in 1984, he ceased performing to focus on making objects. Autobiographical in nature, his work recalls department-store display cases, which serve as settings for his homage's to the past. 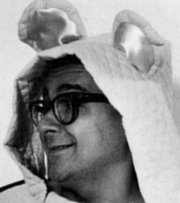 During his childhood in the 1950s, Zerpa was influenced by American popular culture, including comic strips and television. These images appear with bolero lyrics, found objects and emblems, and Christian imagery. His display cases are like altars for reconstructed memories and idolized objects. His one-person exhibitions include Caliente, Caliente, Museo de Arte Moderno, Mexico City, (1982); Héroes y Villanos, La Sala Mendoza, Caracas, (1989); and two Rooms, Two Installations, Museo de Arte Alvar y Carmen T. de Carrillo Gil, Mexico City, (1993). Zerpa's work has been included in the 1981 Medellin Bienal; the 1981 Sao Paulo; Sacred Artifacts & Devotion Objects, Alternative Museum, New York, (1982); Contemporary Latin American Art, The Venezuelans in Two Dimensions: Miguel von Dangel, Ernesto León, Carlos Zerpa, The Americas Society, New York, (1988); Mito y magia en América: Los ochenta , Museo de Arte Contemporáneo, Monterey, Mexico, (1991); Latin America Drawing Today, San Diego Museum of Art, (1991); and Uncommon Ground: 23 Latin American Artists, College Art Gallery, State University of New York, New Paltz, (1992) and Latin American Artists of the Twentieth Century, The Museum of Modern Art, New York, (1993). Zerpa currently lives in Caracas, Venezuela.